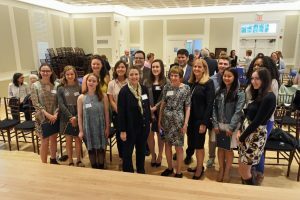 The Westport Woman’s Club Scholarship Committee Chairperson, Arlene Thrope, awarded $27,500 in college tuition scholarships to ten Staples High School seniors and one Adult Woman at our Annual Awards Breakfast on May 26. We have been giving scholarships to Staples students every year since 1925. Proceeds from our Yankee Doodle Fair raffle tickets are used to help fund scholarships.